It’s that time of year when the outdoors starts to call not just keen gardeners, but those who love the feel of fresh air and flowery surroundings which accompany an al fresco dining table. With a little planning, you can transform your garden into a dining room. First and foremost, it’s essential that your garden has a level area with decking or paving to form the basis of your al fresco dining area. This provides a stable base for your outdoor dining sets, and a firm footing for people carrying food and drinks. You also need enough space for diners to walk around chairs and move about freely without getting muddy shoes. If the area is not directly accessible from the house, the same principle goes for the path leading to the dining area. Think of the surroundings as the walls of your dining room and use trellis, walls or fencing for hanging lanterns, baskets of trailing plants and perhaps a few mirrors hidden behind some foliage to add a sense of light and space. For the table itself, invest in some brightly coloured outdoor dinnerware and matching or contrasting outdoor dining chair cushions to make the space bright and inviting. In the garden environment, the walkway spaces and how people will move between house and dining area are even more important than in the living room. A 3D apartment plan works just as well for a garden dining room as any other. You can experiment with furniture placement, check that distances surrounding the furnishings are practical, and use your 3D home design software to plan out your garden space too! If you think you may need a sideboard equivalent for drinks and serving dishes, incorporate another garden table in wrought iron or marble if the budget will stretch to it, or perhaps a rustic side stand made from pallets will do the job just as well. With your 3D home design free software, you can plan the perfect layout, and even include the architectural garden plans to check the overall effect. Make sure the surface is level and easy to walk on, and big enough to accommodate people moving around without feeling restricted. Use your garden edges, whether fencing, trellis or walls, as you would in the dining room with hanging baskets and mirrors as the decoration. 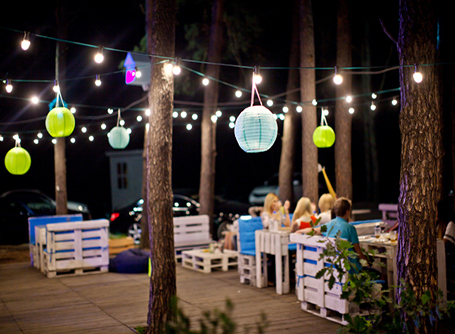 Add hanging lanterns and low-level lighting for a warm ambience. Include low-height lighting for safety and high-level lanterns in different colours to keep the garden bright even at dusk. Make the most of a 3D free plan to work out the spaces and movement of people before investing in any decking, paving or furnishing. Then you’ll get it right first time!